My family likes to make plans. When I became pregnant with our second child, my husband and I snapped into planning mode. Our friends told us that going from one to two children was a fun and exhausting leap. We tried to plan accordingly. My husband, Matt, rearranged furniture and obsessed over how best to clear his work calendar for the late April due date. The previous year, he accepted a teaching position at a local university. We were thankful that his employer offered paid parental leave. For our first child, Esther, there were complications which left me immobilized for many days postpartum, so our attitude was to accept any help that our family, church and neighborhood offered. My mom’s deteriorating health was not part of our plan. Her heart was weakening as we approached the final months of my pregnancy. By springtime, she was placed on a transplant list. We prayed and tried to cheer her on; yet, I felt a gaping space between us. I was in Pittsburgh waiting for a child. She was in Philadelphia waiting for a new heart. When I went into labor, it was an exhaustive 20 hours before our son, Silas, entered the world and was nestled on my chest. 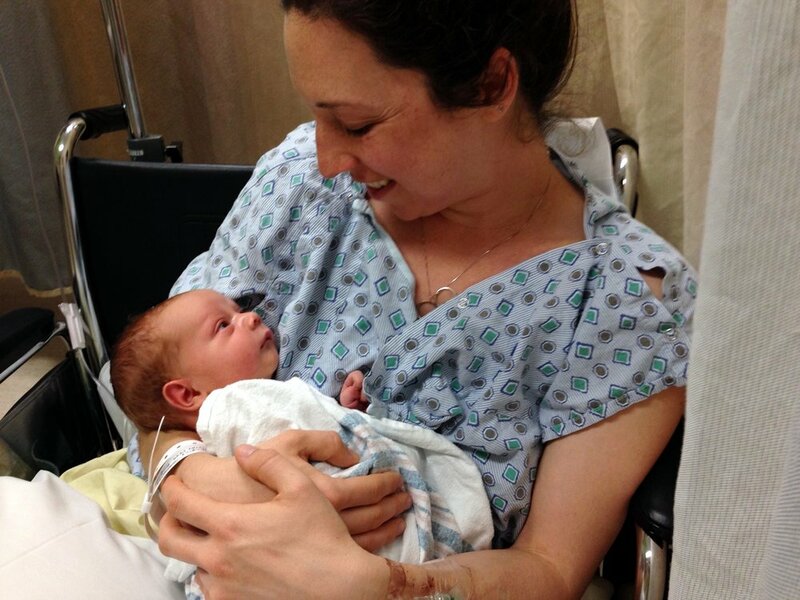 Just as fast as I could exhale his name, he was whisked into the infant exam room. The nurse explained that Silas had poor perfusion, and they wanted to keep him in the NICU for observation. I remember feeling calm, or at least a sense that I had no control over this situation. We didn’t plan for this, but here we were. His delivery had worn us out. At that point, I looked like I had gotten into a fight. My face was swollen; everything ached. My arms and legs were sore, and I wanted to eat an entire pizza. Matt wheeled me to the NICU where we held, fed, and marveled at our little boy. Photos courtesy of the Gormley family. Early in the morning, we shared our news. And then Mom shared hers: She had matched for a transplant! She would receive a new heart that same day. We were tearful on the phone and glad that she had been matched for a transplant, but sharing in the apprehension about the surgery. There wasn’t enough time to process. Immediately after surgery, Mom’s heart and lungs were not functioning. She was put on a bypass machine to keep her alive. My sisters, aunts and cousins converged in Philadelphia. I could sense that my family was shielding me from how bad things were going. I felt helpless. They told me that my job was to rest and care for my son, but as I held him, I grappled with the sense that I might never see my mom again. During this time, Matt’s paid parental leave was incredibly important to us. He was in action mode: organizing meals, shuttling back and forth from the hospital to take care of Esther, bringing me updates on my Mom’s condition and sitting with me when I needed to cry. Mom was making tiny, incremental improvements. Each day we juggled nursing sessions, phone calls with the hospital, and family time. It was 10 days before Mom was breathing on her own, three weeks before she could take steps with assistance, and two months before she held Silas. She was making it through, just as we were recovering too. When we finally reunited, Mom shared more about the hospital tests. We learned that I needed to undergo genetic testing, as I might be a carrier of the same heart condition. Esther and Silas could have the disease. What first had appeared to be an intense but brief storm in our family had turned into an unforeseeably long stretch of grey possibilities. I got the genetic testing, and we spent the last two months of summer waiting for the results. During this time, I saw a counselor, as I was having intense bouts of anxiety without relief. Matt had stretched out his leave so that he could use some of it during this period. As a family, we prayed for courage to go through whatever the test results said. We had no plan for the future, because it felt drastically unknown. We were asking for daily bread and compassion to get through each day of caring for our children and ourselves, and receiving all the help that our community could offer. When I finally got the phone call, we felt relief. My test was negative. Now, when I cradle my son, I think about his easy-going spirit and his snuggly personality. He is the type of child that will climb into your lap just to be hugged and held. He was a living image of how I needed to receive help as I went through this intense, helpless season in my life. Now, I am grateful to watch my mom dote on her grandkids and marvel at her renewed sense of life and enjoyment of her family. My husband’s paid parental leave was instrumental at giving us time to go through this transition. It gave us space to celebrate our son’s birth and care for our family when we were in crisis mode. Matt noticed when my mental health was deteriorating, and he had flexibility to care for our children when I couldn’t. He changed diapers, did bedtime routines and helped with doctor’s visits. Because he wasn’t worrying about his job security, he took ownership and pride in his role as the primary caregiver. He also experienced the grief and pull of wanting to be home when he finally did return to work. And throughout this season, I didn’t feel so alone in the constant struggle to juggle work and family life. We know families that have such small windows of time to be united in caring for new children and themselves. Parental leave served as a cushion of time that allowed our family to experience deep joy, rest and recovery after Silas’ birth. It also allowed for us to walk with my mom through her intense recovery process. Every parent should have this reminder: that they are not alone, especially during the arrival of a new child, and paid parental leave can be an empowering resource. It can be a tool for people to have the freedom to care for each other and be present in challenging moments. And it can communicate a shared societal value for these periods of life, defining them as sacred moments that demand our time and energy. We shouldn’t go through them alone. Candice Gormley lives in Pittsburgh with her husband and two kids. With training in engineering and public health, she has worked as a program specialist in Baltimore City Public Schools for the past eight years. She is passionate about theology, hospitality and work that responds to systemic injustices in vulnerable communities. Currently she is diving into community development at the local level: taking care of children and trying to be a good neighbor. She loves reading, the outdoors and steamy cups of spiced chai. Stories are important: they can direct research, inform policy, and create community. If something in Candice’s story resonated with you, we want to know. Your story will not be shared, but a member of the Time to Care team will reach out to start a conversation.